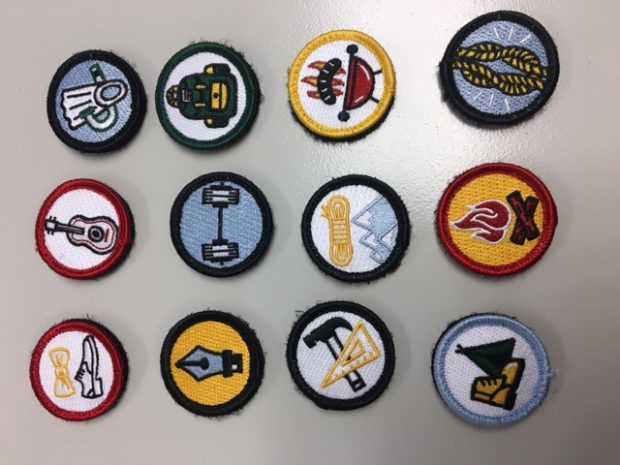 With embroidered patches coming back into fashion, merit badges are a great way to express your interests, hobbies, achievements, and more. Simply attach them to your jacket, hat, pants, tote bag, backpack, or even your shoes and you’ll have a simple way to add personality to your clothing. Merit badges also make great gifts for any personality. For example, if your friend can’t go a day without coffee, you can make her a “coffee addict” merit badge. Or if your husband is “king of the grill”, you can create a merit badge just for him. They can also be used to show off an achievement or as a unique way to celebrate or commemorate an event. We can create your perfect merit badge with a sew-on or iron-on backing to make application easy. And because we use the best materials in the industry, you can be sure your patches will be bold, beautiful, and display a rich, three-dimensional quality. Whether you already have you own design idea or need some help, we’re here for you! Get started on your very own personal merit badge patches today! This entry was posted in General Information and tagged clothing, embroidered, new products, personality, Scouts.